Let’s talk about hair. It’s something I have a lot of, and I like it to be in colours that don’t, unfortunately, grow out of my head naturally. I was born blonde. Growing up I really wanted dark hair and my genetics complied – to a degree. But then nature left me stuck in between blonde and brown in that not-quite-anything shade known as mousy. Now, I’m not a mousy kind of girl. More of a rainbow glitter unicorn, really. 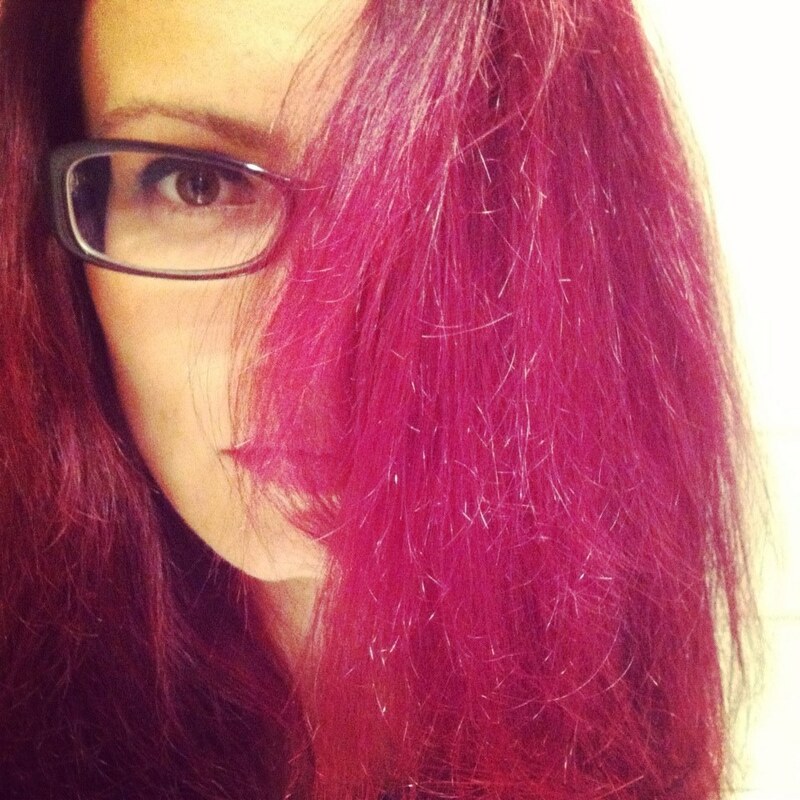 In the last ten years, I’ve put my long hair through everything from blonde highlights to permanent darkest brown, and via aubergine to a vibrant pinkish purple that was my absolute favourite colour but did so much damage that it left me dangerously close to no hair. 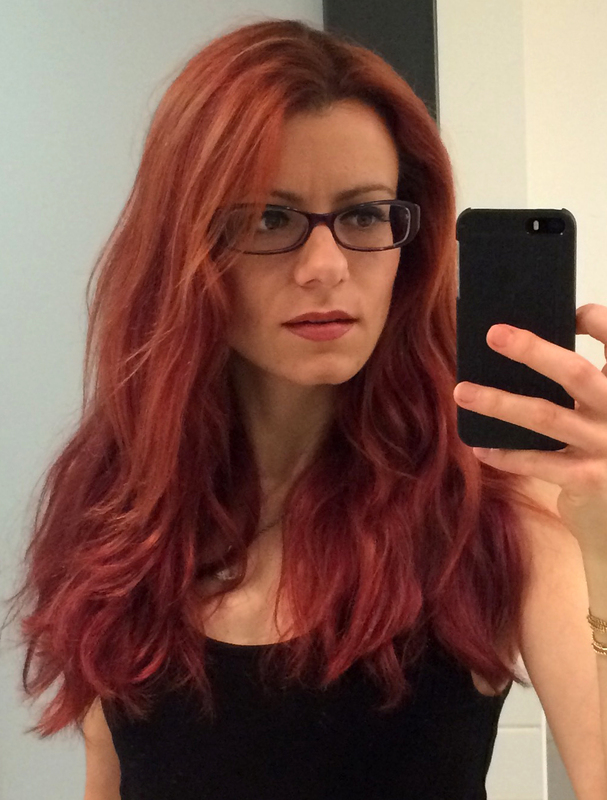 Happy hair days – except my hair wasn’t happy at all. Years of bottle dyes laced with bleach had made my hair so thin and brittle that I left a trail of broken ends wherever I went. I tried to salvage it with a gentle trim and the hairdresser warned me that one more shot of bottle dye and I’d be back getting a full crop. Letting a full head of purple-pink grow out into mousy was out of the question, so I turned to henna in an attempt to contain the damage while at least keeping some degree of colour. A friend recommended Lush’s henna-based colour in the Rouge (brightest red) shade and it was a real life saver. From the first application, it restored my hair more than I ever thought possible. 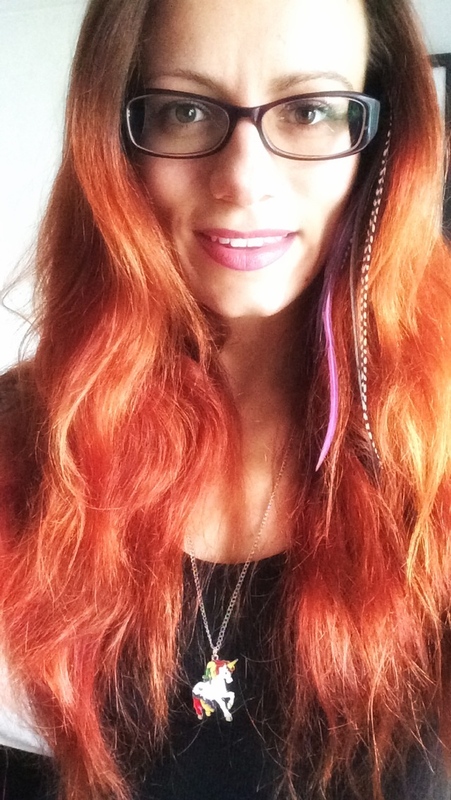 It covered the faded remains of my old colour very well, leaving me with a gorgeous gradient of red shades, from bright copper on the very bleached ends to a deep red on the darker roots. For the first time in years, my hair felt soft to touch and fell in soft waves instead of sticking out in frizzy tufts. Result of the first henna application with Lush Colour. I kept using Lush for a year and with each application the colour deepened and my hair got softer and stronger. It stopped breaking and actually grew, by at least 15cm in the past year. Lush’s all-natural henna colours are super conditioning and create great results, but they are very messy and time-consuming to apply. Here are a few things you need to know before you get started. Sold in a solid block which has to be chopped up finely before you can mix it, adding time to the already lengthy application process. Doesn’t dissolve properly in hot water – the paste stays kind of grainy, making it difficult to apply evenly and a complete pain to rinse out. On long hair you need to condition and brush several times under the shower to get all the grains back out. Separates back into solids and liquid as it dries, so be prepared to wipe away a lot of staining goo dripping off your head for hours. It needs three to four hours to yield proper results. Add to that at least an hour for application, and another hour to rinse it back out, and you basically spend an entire afternoon colouring your hair. Lush henna about three months after the last application. 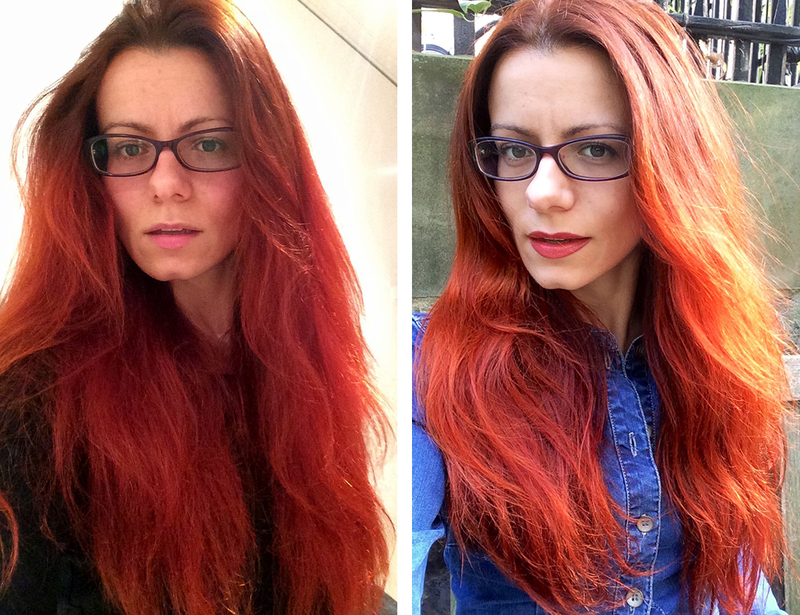 So while I really love the results of Lush Colour, I was open to a more practical and less time-consuming option. Another henna-savvy friend recommended Henne Color from France, which offers a wider range of colours and is available from Holland & Barrett (for example) in the UK. Henne Color lacks the added conditioning ingredients that Lush offers, and it contains sodium picramate which has been researched for potential health risks. But it creates a stunning colour result and a degree of coverage that comes close to permanent dyes, and also comes through more strongly on darker roots compared to Lush. After consulting Henne’s colour chart I chose Acajou (mahogany). 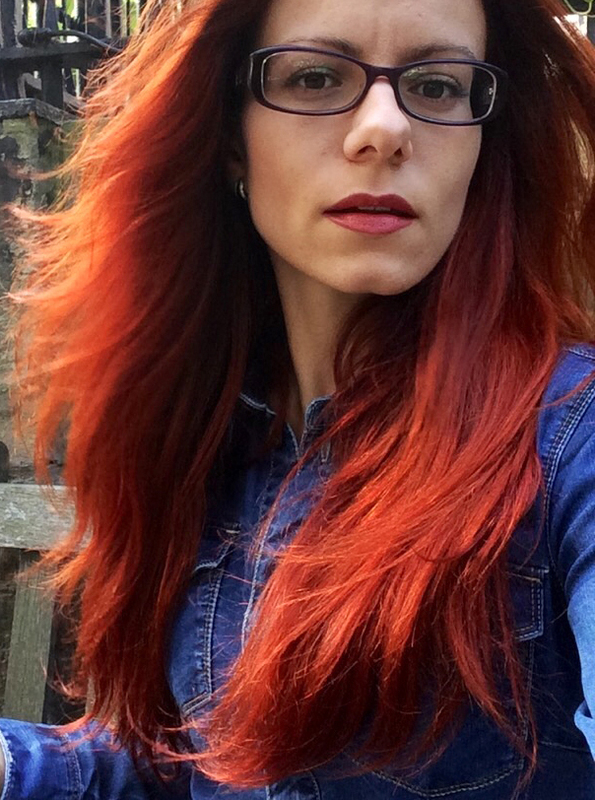 On my hair the result was similar to Lush’s Rouge but with a slightly deeper, less orange tint. The colour came out very evenly across my lighter ends and darker roots, as well as on the various random highlights that are left over from my bleaching days. The coverage isn’t quite as solid as with bottle hair dye though, so the result is a beautiful ombre gradient with natural-looking highlights. Henne Color first application, comparison of inside light and sunlight. 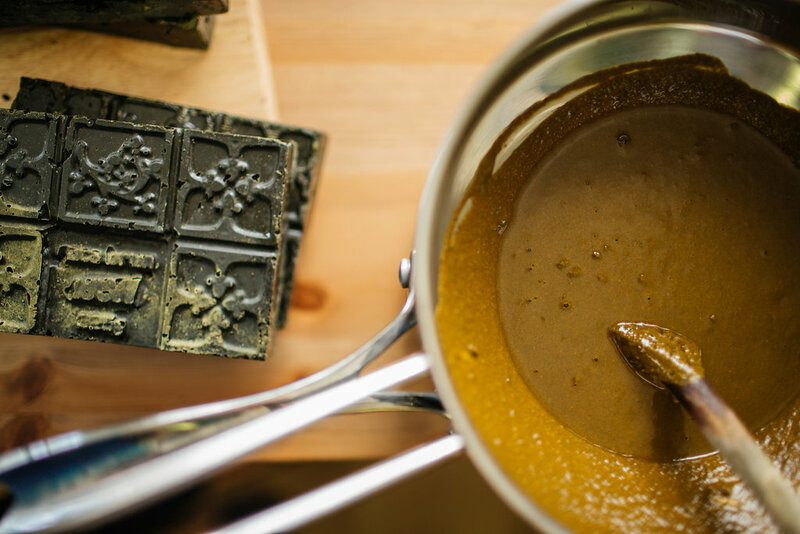 Henne Color comes in a handy powder that dissolves completely in hot water, creating a smooth, melted chocolate-like consistency that’s very easy to apply and quick to rinse out. No problems with crumbling or dripping either. The manufacturer recommends to leave the product in 30 minutes to two hours, so again I went for the maximum time to get the maximum colour out of it. It actually had a conditioning effect similar to Lush’s henna as well, leaving my hair noticeably softer and smoother. Both Lush and Henne Color create great results and are so much better for your hair than chemical dyes. I will forever love Lush’s product for rescuing and restoring my bleach-damaged hair. If you want a product that’s free from all additives and creates a very natural-looking result, this is a great choice. Henne Color, meanwhile, is the quicker and more convenient option so if you’re new to colouring with henna, this will probably work better for you. And if you like your red to be bright and bold, you’ll probably be happier with the stronger coverage it offers compared to Lush. 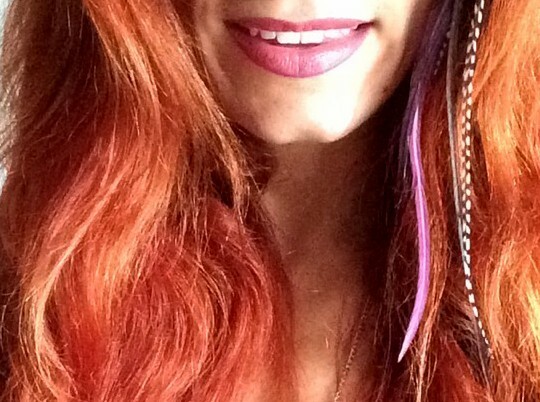 I still miss my purple-pink hair days but I won’t be going back, because the amount of bleaching it requires would end up ruining my long hair completely. But with these two henna products offering a brilliant alternative, I’ll very happily be a redhead for the foreseeable future. Hair sorted; selfie skills still need some work.